Taking a break from, I gather, writing the fifth and supposedly final Young Bond adventure, Charlie Higson took a stroll around London with two of his three sons in tow to follow the footsteps of young James Bond from his adventure Double or Die. Mr. Higson writes about this walk in an article for The Guardian. Locations include Highgate East cemetery, Lincoln’s Inn Fields, and Regent’s Park among others. Previously, IFP published The Young Bond Rough Guide to London that does pretty much the same thing. 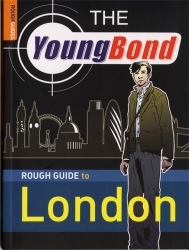 It gives a little background on Young Bond then does a good Rough Guide (hence the title) on the locations of London that are featured in Double or Die. If anyone hasn’t picked that up yet, you should. I’m definitely hittin’ that Royal College of Surgeons next time I’m in London.